An action scene from Shadow. The first thing you notice about Shadow is how accurately descriptive its title is. Save for the skin tones, most of the film is drained of color, giving the whole thing a black-and-white, graphic-novel feel. That, in turn, sets a very specific dark tone—which works quite well, but also makes a slow-building movie feel that much slower. Shadow is directed by Zhang Yimou, best known in the U.S. for blindingly bright epics like Hero and House of Flying Daggers. Shadow is in the same ballpark as those narratively, but a complete 180 visually. The story follows a commander (Deng Chao) who has been secretly grooming a personal doppelgänger (also Chao) to act out his devious deeds under the nose of the king (Ryan Zheng). The political intrigue is ripe and juicy, with multiple kingdoms feuding, alliances shifting, romances forming, and much more. It’s completely engrossing and interesting—but the first third of the film is mostly exposition, with rarely a moment of action to break it up. The early part of the film may look gorgeous, but it drags a bit brutally. Eventually, though, Shadow gets brutal in the best sense of the word. 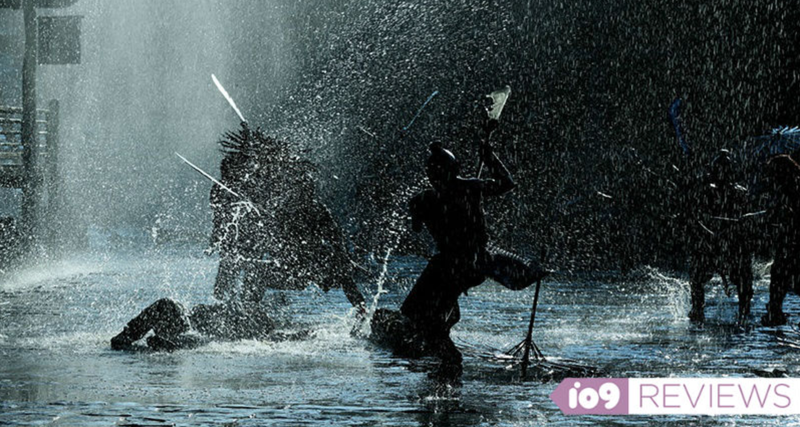 The built-up tension leads to a war between two cities and, in grand Zhang Yimou fashion, the sequence features flat-out incredible action that’s worth the price of admission on its own. There’s slow-motion one-on-one combat, army-on-army showdowns, and much of it features...wait for it...knife umbrellas. All of these scenes are breathtaking and even more exciting after the film’s glacially-paced set-up. From there, Shadow once again dives deep into exposition, but at least this time it’s tempered with action, giving the film a more balanced, satisfying ending. You walk out of the theater happy, which is absolutely a worry during the film’s first act. Thankfully, while Shadow may be an uneven film, the highs are so high they make it worth it, plus the lows are still better than most things you’ll see out there. Shadow had its U.S. premiere at Fantastic Fest 2018 and does not yet have a U.S. release date.